Banksy's Ozone Angel is allegedly a tribute to another street artist named Ozone who was killed by a train. This angel stands holding a human skull, and the angel is adorned with a bulletproof vest. Ozone Angel is extremely popular works that have been reproduced on canvas, stencils, t-shirts, and various other forms. Own this amazing piece of art the easy way. 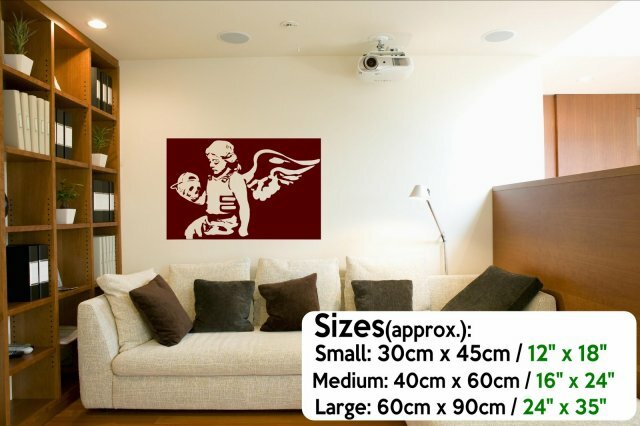 Cut from high quality vinyl sticker this wall art is easy to apply without damages to the surface underneath. Enjoy this easy transformation sticker anywhere smooth indoors and outdoors as the material we use is fully weatherproof and hardwearing. Update your interiors in minutes without specialists tools or experience.